Some of the greatest unsung heroes in Texas sports history are kickers. Despite what has occurred on the 40 Acres the last half decade, Texas actually has a phenomenal history of placekickers. The best kicker in the NFL, Justin Tucker, is a Longhorn. The oldest kicker in the NFL, Phil Dawson, is a Longhorn. 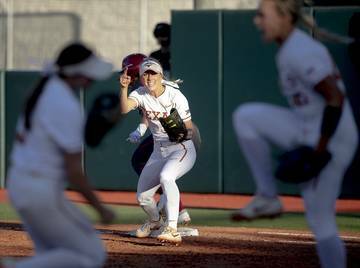 The Longhorns beat Texas A&M in the series finale on a kick. They won a Rose Bowl on a kick. They beat Nebraska in the Big 12 Championship Game on a kick. Kris Stockton, Ryan Bailey, Dusty Mangum, Hunter Lawrence, Jeff Ward, Russell Erxleben are just a few of the memorable kickers to play at Texas and have big moments. One could argue that all good kickers are unsung heroes because no one ever thinks of them as key players. Most of the time they’re an afterthought right up to the point when they’re truly needed. They’re taken for granted by many. 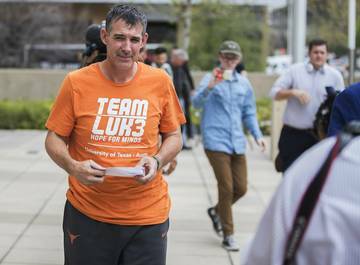 While no kicker made our top 10 of Texas unsung heroes, they’re as important to the history of the Longhorn program as any position. 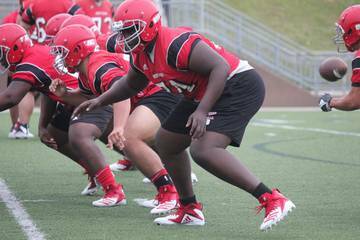 Here are the top 5 unsung heroes of Texas football. All that changed in 1963 when the Longhorns won their first National Championship, and to do it they needed help from someone who had just five catches on the year entering the 1964 Cotton Bowl. Phil Harris wasn’t even the best player on his high school team. That would be Tommy Nobis, who Harris played with at San Antonio Jefferson High School. Harris had scored six rushing touchdowns on just 91 yards for the season, but to say he was a key cog of the 1963 offense is a stretch. But he was in the Cotton Bowl, who in 2010 inducted him into its hall of fame. Harris, a sophomore, caught a 58-yard touchdown pass from Duke Carlisle in the first quarter to give Texas a lead. In the second quarter he caught a 63-yard touchdown pass from Carlisle to eventually give Texas a 14-0 lead. 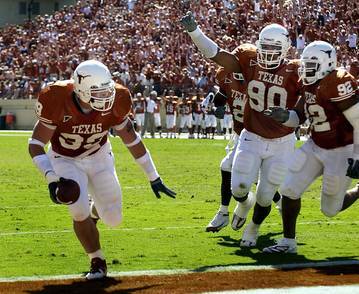 The Longhorns never looked back and won 28-6. Harris finished with three catches for 157 yards and an average of 52.3 yards per catch. 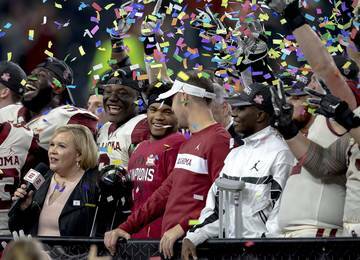 It’s not the greatest bowl performance ever in program history, but it’s the most surprising bowl game performance ever. Harris caught just 26 more passes in his career at Texas and none were for touchdowns. He rushed for 123 yards as a junior and 370 yards as senior, but for one game, Harris was literally a Hall of Famer. Texas running back, Eric Metcalf. Photo courtesy of the University of Texas at Austin. Like D’Onta Foreman and Jackson Jeffcoat on this list, Metcalf’s Texas career is often forgotten by fans because the teams he played on underachieved, but Metcalf was one of the most exciting Longhorns in program history and one of the greatest NFL Longhorns ever. But his teams were not so great. His freshman season in 1985 finished 8-4 but lost in the Bluebonnet Bowl to a service academy, Air Force. In 1986, Fred Akers’ last as head coach, Texas went 5-6. The 1987 and 1988 seasons, the first two under David McWilliams, yielded 7-5 and 4-7 records. Despite a 4-7 season in 1988, Metcalf rushed for 932 yards and eight touchdowns, caught 42 passes for 333 yards and two touchdowns and returned punts and kickoffs for eight- and 16-yard averages. He was a three-time All-SWC player, the 1987 SWC Player of the Year and an All-American. He is fourth all-time in all-purpose yards and is the all-time leader for receptions by a running back in Texas history. For all the talk of Texas hiring the best coach in the country every time the job opens, or when the Longhorns lose any game, only once has Texas really ever gone out and hired the very best coach in the country at the moment. And that one guy is largely responsible for making the program what it is today and many Longhorns have no idea who he is. Dana X. Bible is the only coach on our “unsung hero” list and there’s a case to be made that he’s one of the five most important figures in Longhorn athletics history. There’s Darrell Royal and Mack Brown. There’s DeLoss Dodds. And then there’s Bible, the guy who hired Royal. Bible took over the program when it was at its lowest point and put Texas on the college football map. Bible was the coach at Texas A&M in 1917 and 1919-1928. He left A&M to become the coach at Nebraska in 1929. When Texas hired him he already had 135 career college football wins. He won 72 games at Texas A&M and 50 games at Nebraska. 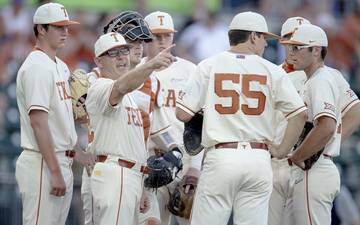 When Texas hired Bible in 1937, the Longhorns were coming off a 2-6-1 season in 1936. Texas had back-to-back losing seasons, but even before then Texas hadn’t quite capture the national attention of college football. The previous coach, Jack Chevigny, had driven the program into a hole, and Bible was tasked with a completely overhauling Texas football. His first years were rough. He went 2-6-1, then 1-8 in year two. But by year three, Texas was 5-4. In 1940 Texas had a 8-2 season and peaked under Bible with a 10-1 record in 1945. He became the winningest coach in program history when he retired from coaching in 1946 with a 63-31-3 record and three SWC titles. When he left coaching he hired Blair Cherry, who went 32-10-1 from 1947-1950. His next hire was Ed Price, who went 9-2 in 1952 but a 1-9 season in 1956 forced Bible to change coaches. He hired Darrell Royal and retired. 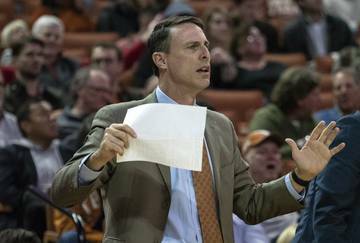 Bible is the first and only coach to truly survive a bad start to his Texas career. He modernized Texas football and brought stability to the program, yet Bible lacks the notoriety of other football pioneers like Knute Rockne. 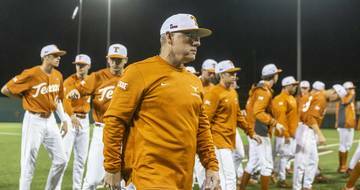 But without Bible’s tenure at Texas, who knows what the program looks like today? Peter Gardere lead the Longhorns to a 1990 season-opening win at Penn State. (University of Texas at Austin). Peter Gardere is the only quarterback in the history of the Texas-Oklahoma rivalry to go 4-0 in the series. I can stop there, but wait there’s more. Gardere played for two head coaches, David McWilliams and John Mackovic, and was the best team of the McWilliams era, the 1990 Longhorn squad, and also on some teams that weren’t great, namely all other teams he was on. One thing Gardere should be known for is being the first true prolific passer in Longhorn football history. When he graduated, he owned just about every Longhorn passing record. Most yards for a freshman, most yards in a season, most career passing yards, highest completion percentage, fastest to 2,000 yards passing in a season, most starts, most attempts, most competitions. Unfortunately the only passing record he still owns a piece of today is interceptions, but Colt McCoy wouldn’t even let him have that one for himself. But he’s here because he accomplished something McCoy, Vince Young, James Brown, Major Applewhite and James Street didn’t do. He won four games over Oklahoma. We’ll dismiss the fact that he was 1-3 against Texas A&M but if you count his 2-1 record against Arkansas, Gardere was 7-4 against Texas’ biggest rivals in his four years as a starter. And that’s another thing to look at. 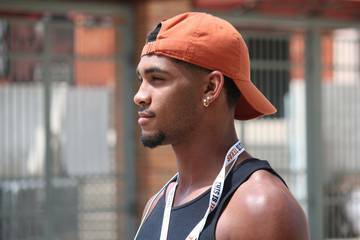 There are only three quarterbacks in Longhorn history who were 4-year starters at Texas. One is Colt McCoy. One is Pro Football Hall of Famer Bobby Layne and the other Gardere. 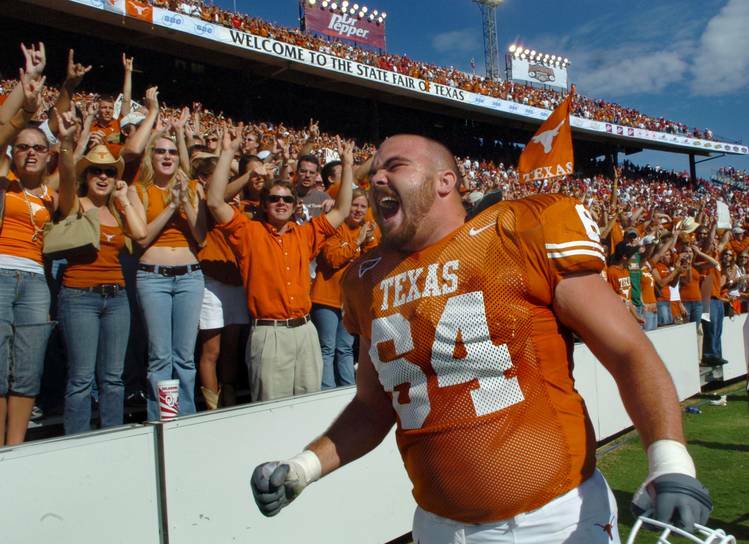 “Peter the Great” also steered one of the scrappier teams in Longhorn history. To say McWilliams needed a miracle in 1990 for him to coach in 1991 is probably an understatement. That Longhorn team did just that with a 10-win season that saw Texas beat No. 4 Oklahoma, No. 3 Houston, No. 17 Texas A&M, No. 21 Penn State and No. 25 Baylor. Yeah, the Cotton Bowl game against Miami, a 46-3 thumping, was not great and probably killed any good vibes the program had built through the course of the season. It doesn’t take away what Texas and Gardere accomplished. He threw for 2,131 yards and 11 touchdowns. It’s easy to remember the names of Vince Young, Michael Huff and the rest of the stars on the 2005 Longhorns. But few names like Lyle Sendlein, Jonathan Scott, Will Allen, Justin Blalock and Kasey Studdard roll off the tongue. It’s not coincidence the last Texas team to win the national championship also had the best offensive line ever at Texas. Studdard, Blalock, Scott and Sendlein all played in the NFL. Allen, Blalock and Scott were All-Americans in 2005, and Scott was a consensus All-American. Blalock was a consensus All-American in 2006. In 2005, these blockers helped pave the way for one of the greatest offenses in college football history. 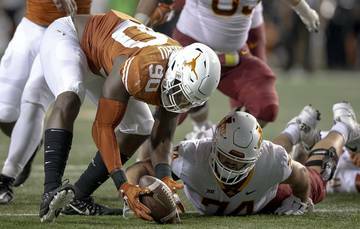 The Longhorns rushed for 3,866 yards and 55 touchdowns. They gave up just 14 sacks on the year while also helping the unit average 7.1 yards per play. Obviously it’s hard to dig up individual blocking stats for linemen, but consider this line was the last to feature multiple future NFL players on one line and the whopping success of the offense, it’s easy to point to how good this group was and why Texas won the title. If the quarterback is the most important player on offense, many football people — people who really understand the game — will tell you that the tackle positions are the second most important, and Texas’ two tackles, Scott and Blalock, are the best pair of Texas tackles this century and maybe of all-time. Bob McKay and Bob Wuensch on the 1969 team make a strong case as the best ever, but neither were consensus All-Americans. And those lines were dominant in the heyday of the wishbone. They had to be when the team is running the ball almost every play. But then again, the faster pace, the added difficulty of pass blocking and fewer lead blockers in the backfield in the 2005 spread scheme means there was more onus on the 2005 line to open running lanes. No team has ever won a national title with a bad offensive line. And few teams have ever gotten close to winning a title with a struggling line, which ironically one could include the 2009 Longhorn team on that list. That team had two All-American selections on the line, Chris Hall and Adam Ulatoski, but neither were consensus All-Americans and that team allowed 31 sacks (to be fair, Texas attempted more than 300 more passes in 2009 than 2005) and averaged just four yards per rush, compared to 14 allowed sacks and 5.9 yards per rush in 2005. However, there was no nine-sack game in 2005, like there was in 2009 when Nebraska’s Ndamukong Suh had one of the single greatest college football games ever, sacking Colt McCoy 4.5 times. In the 2006 Rose Bowl, USC never recorded a sack. Texas rushed for 8.0 yards per play. The greatest team of the last 40 plus years of Texas football had the greatest unsung heroes of all.